This is an ocean front condominium on the eighth floor located in a great building with its' own parking garage. The ocean is right in front of you! Sit there and watch the sunrise each morning, look for dolphins swimming the coast or schools of fish or sea turtles just people watch. During the day, enjoy the beach, rent an umbrella and chairs from the lifeguard and you’ll be set up in your reserved spot each morning. All you have to do is just plop down in your chairs and enjoy. Go to the on-site lounge for a quick snack or drink, gift shop, pool, hot tub or just sit out on the balcony or beach and enjoy the ocean breeze. In the evening you can go to the on-site lounge and enjoy yourself without ever getting in your car. If golf is your game, slip out to one of the over 200 great local courses and still have time to come back and enjoy the beach. If fishing is your game you have your choice, you can fish on the beach early mornings or in the evenings or at Garden City pier just a ½ mile away or go deep sea fishing available at Murrels Inlet just down the road. In the evenings, enjoy many fine dining places offered in Garden City and Myrtle Beach. Afterwards enjoy the on-site lounge or the many other local night spots or just sit back and enjoy the moonlight and ocean on your balcony. This is truly a home away from home. This Condo comes with just about everything except you! Come sit back and relax with peace of mind. We’re looking for your family to join our family of former guests. We want a relationship with our guests not just a transaction with them. Each year we've made improvements to the unit and intend to keep making it one of the finest units available. We hope that you'll find the unit to your liking and return year after year. We wanted a place at the beach which was on the beach and in a building that had it all. Perfect view of ocean and beach, on site shops while close to Myrtle Beach action but far enough away where traffic and noise isn't an issue. Master bath has walk in shower and vanity and high rise toilet. Hallway bath has full shower and vanity and high rise toilet. Right on the ocean. Horry County Life guards on duty all summer. Umbrella and chair rental provided through them if needed. Linens for bed and pull out sofa plus towels can be supplied at small fee. Kitchen & Bath towels provided with small fee. 2 Elevators to use during your stay. 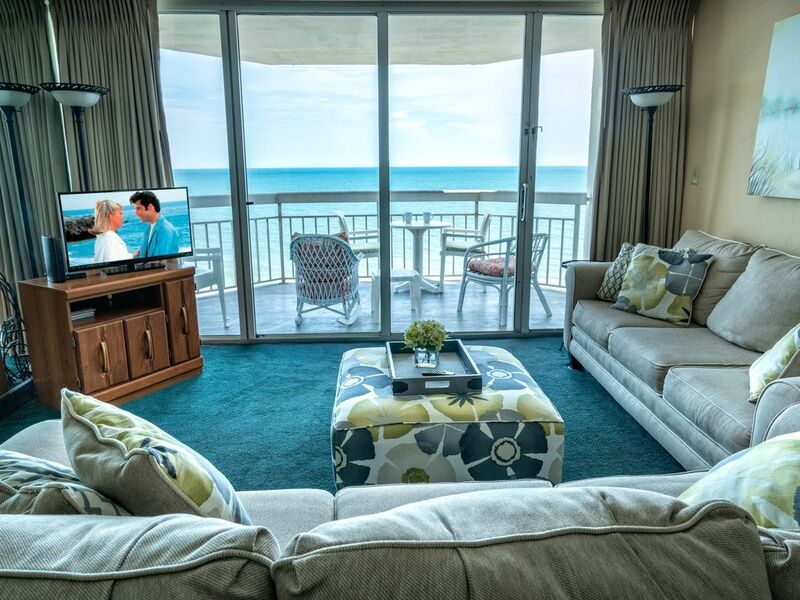 Look out at the ocean from inside unit or have a seat on balcony and enjoy the view. This is our second month-long stay at Blaise’s condo at Water’s Edge. Last year was great, and this year was even better due to the renovations since last year. The new bathroom and kitchen renovations added a real upscale touch. Blaise always responds to calls and emails within minutes, and wants to be sure everything is going well. We are spoiled by the wonderful oceanfront location, the washer and dryer in the unit, two bathrooms, and great location. Would definitely recommend this condo! From start to finish, we were made to feel like guests and not just someone renting a condo. Blaise checked to make sure we were happy with the condo upon arrival and was fabulous helping us through our first hurricaine. We could see for miles from our balcony, had plenty of parking and were so close to all the local eateries and fun. Sadly, our trip was cut short but we’ll be back! Blaise is a great host and this is a fabulous place to relax or explore the area; whichever is your vacation style. Very cost friendly ! Quiet oceanfront 1 bedroom. Owner nice and attentive. Would’ve liked a larger master bedroom but mattress very comfy !! Would come back again ! Love Garden City ! The unit was terrific! Clean, bright, all the amenities needed, and all that was advertised. Wish we were still there now! Will look into renting from Blaise again for next year, highly recommend this unit. Thanks. Great unit. We and our friends enjoyed every minute. Unit was clean, well equipped, and very comfortable. This is our first time staying in Garden City and we are already talking about staying here again! Our stay the week of July 4th in Garden City was fantastic! Our Condo met and exceeded our expectations. It was furnished and decorated just beautiful. The Master Bath was amazing! The view from the 8th floor was breathtaking. The description of the property was perfect and the rates for the holiday week was very comparable to others in that area. Being close to the Garden City Pier, Shopping Malls and various Restaurants was a primary concern for us when choosing our vacastion getaway. We found it and enjoyed every minute of it!! We highly recommend HomeAway.com Inc. and Property ID 185652.